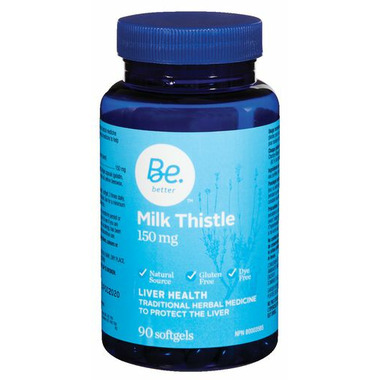 Be Better Milk Thistle is a natural, gluten free, and dye free traditional herbal medicine used to help protect the liver. Dosage: 1 softgel, 3 times daily, or as recommended by a physician. Use for a minimum of 3 weeks to see beneficial effects. Ingredients: Milk Thistle (Silybum marianum) (seed) (60% silymarin) 150 mg, Softgel capsule (gelatin, glycerin, purified water), soybean oil, yellow beeswax, lecithin. Consult a physician if symptoms persist or worsen. Consult a physician prior to use if you are pregnant. Hypersensitivity, such as allergy, has been known to occur, in which case discontinue use.